Bryan Ferry's 'Frantic' is his first album to feature original material since 'Mamouna' seven and a half years earlier. The album is put together from various sessions and projects that Bryan had worked on since 1992. during this period, Bryan had work with Eurythmics Dave Stewart on an album called 'Alphaville' which has remained unreleased. Some of the tracks from the 'Alphaville' sessions made their way on to 'Frantic' either slightly re-mixed/edited or completely re-recorded. The album is a mixture of original material and interpretations of other artists songs. Bryan recorded some of these tracks during his 'As Time Goes By' tour in 2002 with pianist Colin Good, bassit Zev Katz and the string section from that band. He also went back to the studio to re-record some of the 'Alphaville' sessions with members of the Roxy Music 2001 tour band, including original Roxy drummer Paul Thompson. The original version of 'Goodnight Irene' dates back to 1992 during the sessions for his 1993 album 'Taxi'. More info including sleeves etc for these singles can be found in the FRANTIC For Collectors section of this site. 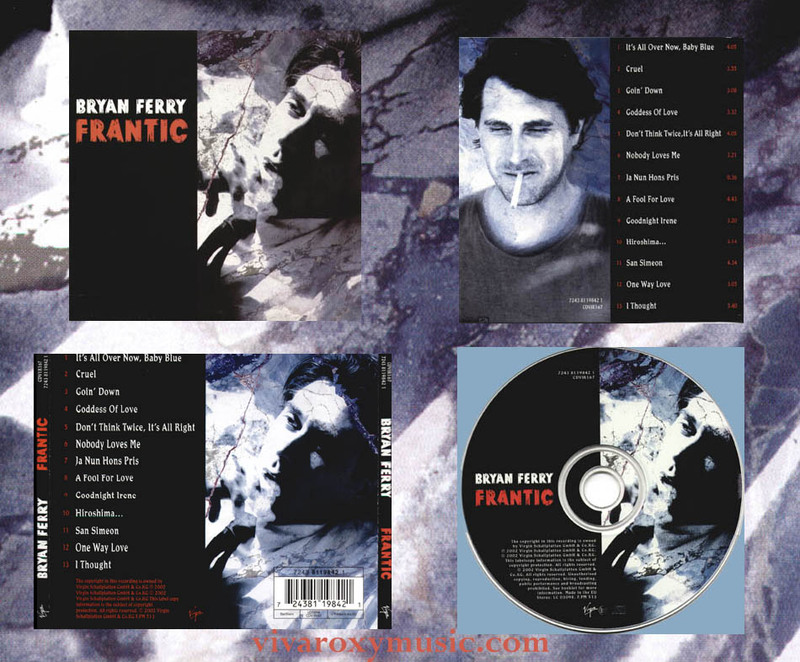 For completists and collectors, the DVD audio version of 'Frantic' will have the Bob Clearmountain Mix of 'Hiroshima', the other formats will include the Ash Howes Mix. 'I Forgot More Than You'll Ever Know' is an exclusive track available only on the Japanese issue. The lyrics to all the songs on 'Frantic' can be found by clicking on each song title below. At the bottom of each song page is a link 'view the lyrics'. The individual song credits are on these pages too. Nathalia Bonner Strings on It's All Over Now Baby Blue, Cruel, Nobody Loves Me, Strings & Vocals on San Simeon, Strings on I Thought.